The guitar tone on Sons Of Sleaze is a sine wave pulsing with fuzzed out energy, pre-packaged with toxic hazard sign and all. Unwashed, unkempt, and reeking of last week’s rum and pizza binge, Illinois’ Bones earn their touted crust stripes, playing some of the most febrile, abrasive, punk-driven death metal around. Oi-ridden, thrashing, replicating Repulsion‘s causticity and Swedish death metal’s unsubtle bludgeon while trading tales with Autopsy and Impetigo in the sewer; all blended in with their own slant on the underground, gleaned through a not inconsiderable knowledge of styles, these three veterans, gathering forces after the demise of scene legends Usurper, craft a remarkably urgent and vital little album of pustulous American death metal. There is a lot happening beneath Sons Of Sleaze‘s unassuming demeanour, a pose and vibe that would seat them comfortably among Razorback‘s extensive horror-drenched roster over the years. But a little attention to detail reveals the constant restiveness of this music. 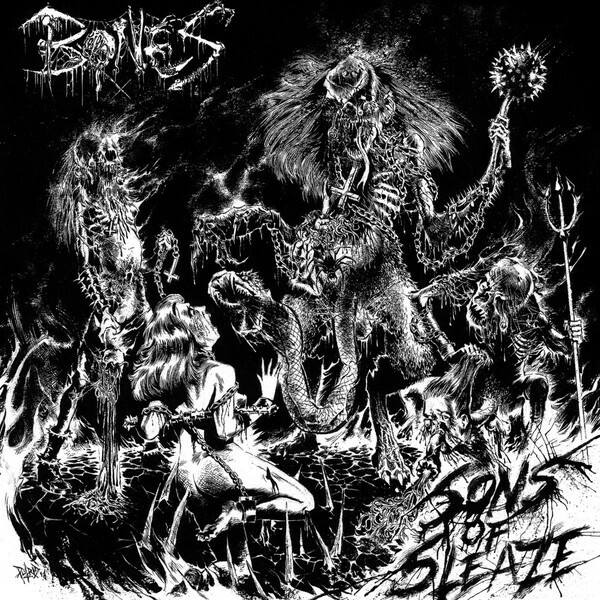 Bones are rarely content to milk a good riff; each song is laden with a multitude of changes, mostly simplistic, admittedly, but still integral in perpetuating the hi-octane flow of the album. The members’ trained hands obvious, Bones show great dexterity in assembling coherent wholes from primitive components. Transitions are nearly always seamless; for music such as this, riddled with patterns, bridges between progressions assume greater significance. Bones, as one would expect from seasoned musicians, don’t miss a trick; Sons Of Sleaze contains properly mapped out songs that, in spite of the studied sloppiness, manage to gain increased familiarity with repeated listens, not something to be scoffed at in this particular niche of death metal. The drumming is fairly straight forward, frequently relying on the D-beat as skeleton to the bare-faced punk around. Breakdowns are littered all over this album, coming in every flavour conceivable, acting as theme, segue and filler all at once. There is a loose, jam-like quality to many of these riffs, seemingly collated out of every entry in the band’s collective consciousness, then cobbled together in an impromptu burst of adrenaline. But Bones are supremely confident as well, strutting and straddling a somewhat stale style with the enthusiasm of youth tempered with the weight of experience. This entry was posted in Music Reviews and tagged autopsy, Bones, Chicago, Crust, death metal, Illinois, Impetigo, Motorhead, punk, Sons Of Sleaze, Usurper. Bookmark the permalink.